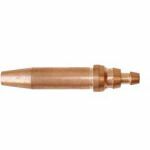 Standard length ANM nozzles for cutting with oxy/acetylene. For use with an NM cutting torch (A110131) or a heavy duty cutting attachment (A100174). Available in various sizes. Extended length types also available - ANM-6L also known as ANME. Please login/register to add a product to your favourites.